Obama made his fourth visit to Seattle today; this one was different. Having attended two previous rallies where the crowds were under 5,000, I assumed that Key Arena, home of the Seattle Supersonics, would be large enough to handle the crowds. After all, when Paul Simon played there a few months ago the place was about half-full. So I arrived after the doors opened. Oops. There were thousands of people on both sides of the arena hoping to get a glimpse of Obama even after the doors were shut and the place was at capacity (~18,000). 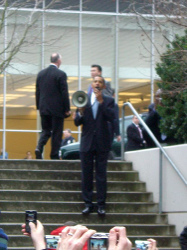 Luckily, on his way in, Obama came by and spoke to the overflow crowd with a bullhorn, so we ended up being closer to him than we would have in the arena. Of course, the main point of the rally was to get Obama supporters excited for tomorrow's caucus. If you live in Washington State, you probably already know that there is a separate Democratic primary which will have no effect on the delegates selected; you must caucus, in person, Saturday at 1p for your vote to count. That's right, you can throw away your absentee ballot; if you got one, it won't count. Make sure you go to the right location; you can find yours here. Questions? There's a caucus FAQ, too. Can't wait for tomorrow's results! Thanks to GR for the picture.